Last week, Rowan taught Ginevra and I how to make the pattern for our skirts. This is one of several methods/shapes that can be used. We are using this method because it will allow us to piece together our large skirts, use fabric efficiently, and it is a tried and true method used by Rowan for her dresses. In order to quantify the material needed to make the skirt, Ginevra and I needed to work out the measurements for the whole thing (including the brocade contrasting bands). The first step in doing this involved measuring the dimensions of the period portrait inspiring my desired skirt pattern (Portrait of a Lady with Apple – see my initial update in the 2014 menu for references). The graded proportions of the banding in Saxony skirts are what makes them so striking. In order to replecate this in my dress, Mistress Rowan let me use one of her books of portraits depicting garb of this period (reference to be attained), which includes a high-quality image of the inspirational portrait for my skirt. I measured the height of the banding in the skirt, as well as the entire length of the skirt (from just below the true waist, to the floor. I recorded the measurements on a quick sketch (see Figure 1 and Table 1). 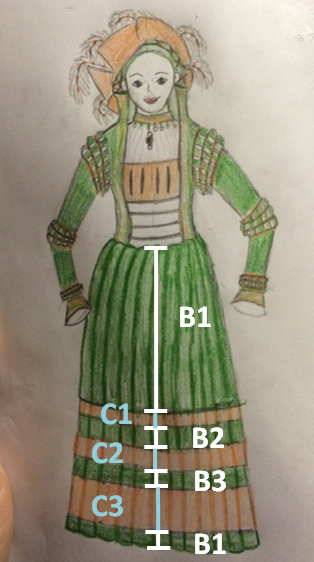 Figure 1: Rough sketch, including measurements, of the skirt proportions from ‘Portrait of a Lady with Apple’ in milimetres. Total length 141mm. From top to bottom the measurements were: 77mm (B1), 8mm (C1), 11mm (B2), 10mm (C2), 12mm (B3), 17mm (C3) and 6mm (B4). Sketch and measurements by Ceara Shionnach, 2014. Table 1: Converting the portrait meausrements to my measurements. Table, and measurements taken by, Ceara Shionnach, 2014. 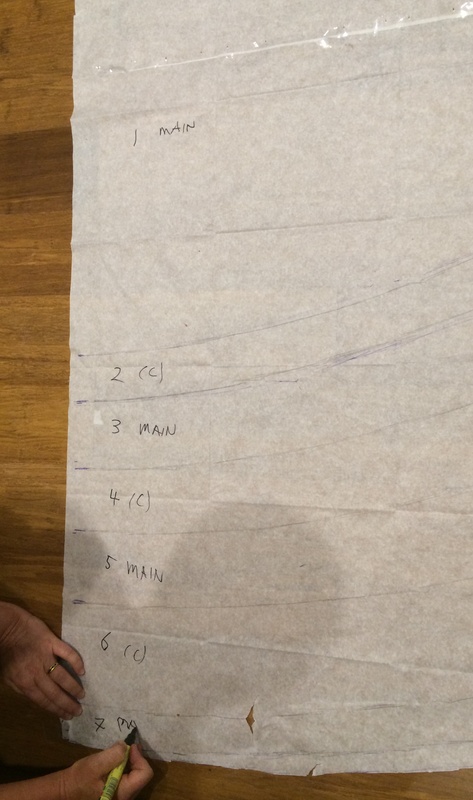 B1, B2, B3 and B4 = Base fabric sections 1 (at waist), 2, 3 and 4 (at floor). C1, C2 and C3 = Contrast fabric sections 1 (top), 2 (middle) and 3 (bottom). Figure 2: My original design (from first update in 2014 menu) sketch with banding codes labelled. Figure 2: My original design sketch (from first update, located in the 2014 menu) with banding codes labelled. Image by Ceara Shionnach, 2014. The next step was to take my measurement from just below waist to the floor so that I could use the measurements taken in Figure 1 as ratios to apply to my skirt measurement. Table 1 shows my working for deriving the heights of each of the bands of my skirt. 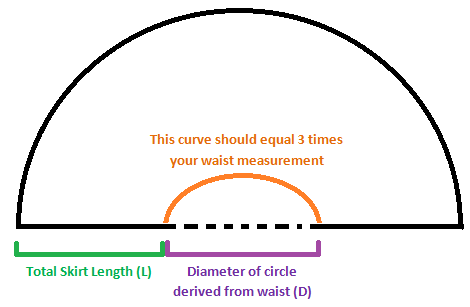 D = (2 * 3 * W)/π), where 3 x w is three times your waist measurement, and the 2 doubles it (since your waist will be cut out as a semi circle). 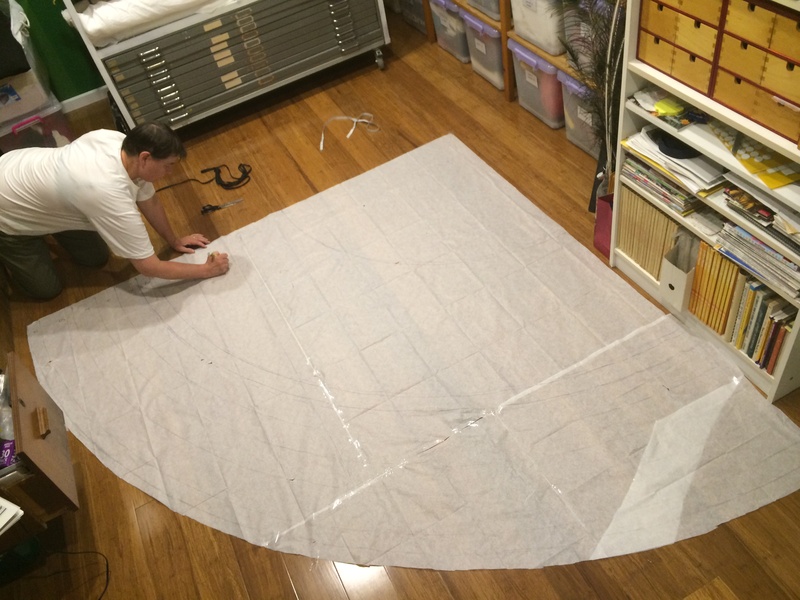 The last measurement I needed to draw the outline of the whole skirt was the radius of the largest semi-circle. That value is determined by the formula: L + (0.5 * D). Figure 3: Overall skirt pattern for a semi-circle shape. 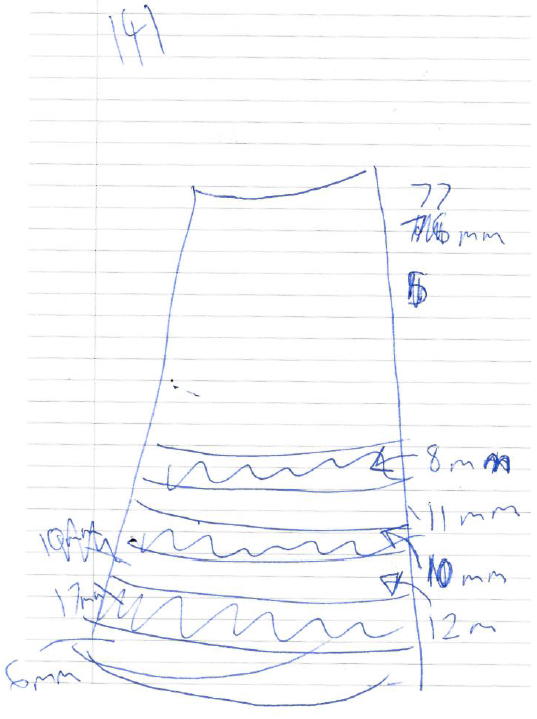 Figure 3: Overall skirt pattern for a semi-circle shape. Graphic by Ceara Shionnach, 2014. After these measurements were made, I needed to make a paper pattern for the skirt (since it’s going to be made of many pieces of fabric, being a half circle skirt). 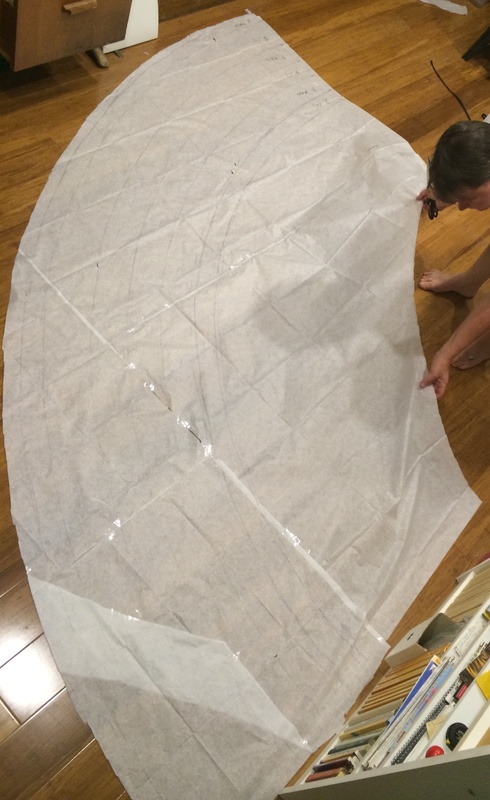 Pattern paper (Figure 4) was laid out flat on the floor, and the diameter of the largest semi-circle of the skirt was drawn on using a metre ruler (this diameter being 2 * L + D in Figure 3, above). The half point of this line is mark with a pencil. Then, a long piece of string is fixed/held at this half point. The pencil is tied to the end of the string, exactly the radius of the largest semi circle (i.e. the distance from the mid point to one end of the line you just drew). This allowed us to, keeping tension on the string and keeping the pencil straight, draw the arc of the largest circle of the skirt. 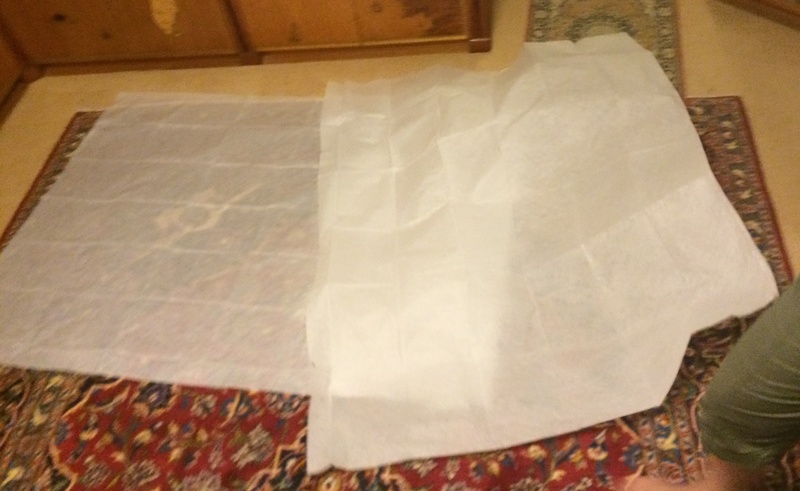 Figure 4: Pattern paper was laid out and taped together to cover an area larger than would be required for the skirt. I needed two large pieces of this particular paper to map out my skirt. Photo by Ceara Shionnach, 2014. The pencil was then untied from the string, and retied to the radius of the inner semi-circle for the waist (which is equal to a distance of 0.5 * D, as determined in previous formulas). With the string still secured at the half point of the straight line, the arc of the waist is drawn on. To draw on the curve of the bands, the pencil was moved to various locations along the string. For example, to draw band C3, two arcs were drawn that were 4.7cm (B4 height) and 18.9cm (B4 + C3)away from the outer perimeter of the skirt. Once all of the skirt, including all of the bands, is marked out, the bands were all clearly labelled (B1-4 and C1-3 – see Figures 5 and 6). Then the skirt as a whole is cut out. Next, the curve for the waist is cut out and removed from the pattern (see Figure 7). Figure 5: All of the bands are being labelled after they were drawn on using the pencil-tied-to-string method. Photo by Ceara Shionnach, 2014. Figure 6: A closer look at the banding and labels on the skirt paper pattern. Note that main 1 = B1, and so on, and so forth. Photo by Ceara Shionnach, 2014. Figure 7: The pattern with the waist arc cut out. Photo by Ceara Shionnach, 2014. The next steps will be to cut all of the bands out, and use them to calculate how much fabric I need to order for my contrasting bands. The fabric for the contrasting bands will be a rusty orange silk brocade.